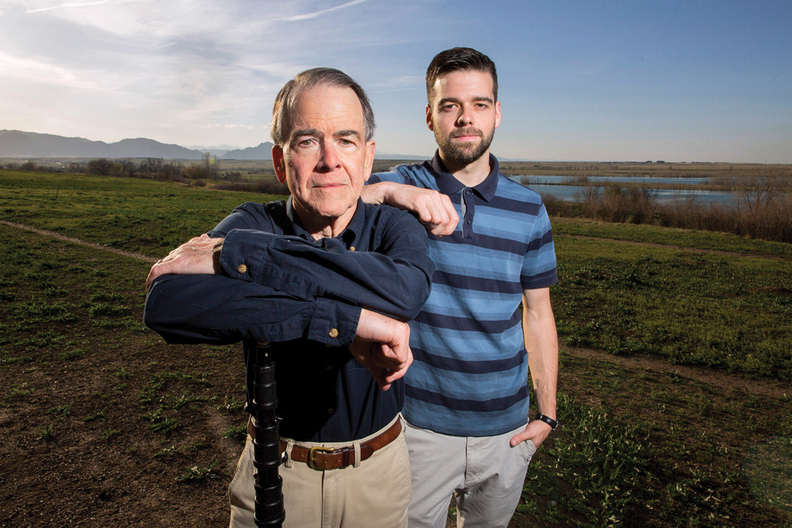 Chuck Woodard and his son Jeff stand near Stanley Lake in Arvada, Colo. After a horse-riding accident left him saddled with a stack of hospital bills, Jeff worried how his disputed bills might affect his credit. The bills amounted to hundreds of thousands of dollars. But Woodard's employer-sponsored health insurance limited his out-of-pocket maximum payment to $5,000. He reached that "within like a day," he recalled. But he didn't expect another set of payments to haunt him and his parents for nearly a year. While medical bills are a leading source of personal bankruptcy in the U.S., a far more common problem is the widespread damage they do to people's credit. Almost 40% of adults younger than 65 reported a lower credit score because of medical debt, according to the most recent Commonwealth Fund analysis, based on 2016 data. In Woodard's case, his parents had been deliberate in making sure that all the care their son received was within his insurance network. But it turned out that the trauma doctors at the in-network hospital were not. They were employees of Aspen Medical Management, a Colorado Springs, Colo., physician staffing firm that employs physicians and contracts them out to hospitals. "I was planning on refinancing my mortgage," he recalled, a change that he said would have saved him $15,000. "But if I got a bad hit to my credit score, it wouldn't save me any money. I was paranoid about that." Woodard's persistent appeals succeeded, and his debt was settled just days before it was set to hit his credit report. "I was going to write (Aspen) a check, but my parents insisted I didn't," he said. "I was incredibly lucky." Medical debt isn't like other financial obligations. It might result from illnesses and accidents, or because consumers don't fully understand their health plan. Eventually, that medical collection dings the patient's credit, staying for as long as seven years, depending on state laws. It's part of a multibillion-dollar industry: In 2016, the most recent year for which there are figures, agencies collected just under 10% of the $792 billion consumers owed in overall debt, according to an industry report. "Let's say, two years from now, mortgage rates plunge down to 2%, and I want to refinance," Wu said. "And the mortgage broker tells me, 'You can't get the best rate. Your credit score is 650, and it's being dragged down from this unpaid collection from this hospital.' "
Rodney Anderson, a mortgage broker in Plano, Texas, sees this regularly. Starting in 2008, he noticed that almost half of his clients had weaker credit ratings because of medical debt. Even now, it affects "five to 10" of his clients each day. Apart from credit-reporting modifications, some states have laws to protect patients from surprise billing, which many experts say trigger these financial issues. But these measures are also limited. They typically prohibit balance billing—charging patients for the difference between a list price and what insurance paid—in only certain care settings, or shield patients from the payment responsibility, though they don't necessarily stop providers from sending a bill. Unpaid medical debt "is an important metric for lenders and creditors," said Eric Ellman, senior vice president for public policy and legal affairs at the Consumer Data Industry Association, a major trade group. Citing changes such as the 180-day waiting period and upgrades to reporting systems, he added, "I'm not sure there's more that needs to be done on this." Consumers now are responsible for more of their healthcare costs, noted Sara Collins, the Commonwealth Fund's vice president for healthcare coverage and access. Middle-class people in particular, she added, are more likely to see unpayable medical bills. Because Woodard's debt was settled just days before it was set to hit his credit report, he has since been able to purchase a new car with favorable terms that would have been unavailable to him had this situation turned out differently. His 72-year-old father is now advocating for changes in how Colorado bills patients. "No one tells you what your rights are," Chuck Woodard said. But Jeff Woodard's case may not be over yet. This March, he received another bill for an ambulance he took to the hospital. He has started negotiating once more, with his insurance plan and the fire department's billing company. And based on his experience, he doesn't expect an easy process. "I was incredibly well-advantaged, and I barely made it through," he said. This story originally appeared in Kaiser Health News. Kaiser Health News, a not-for-profit health newsroom whose stories appear in news outlets nationwide, is an editorially independent part of the Kaiser Family Foundation.